Education is achieved through preparation. Active Minds prepares for our field trips unlike any other summer camp. From November thru January, as we develop our yearly summer schedule, our team is busy doing site visits of each location to assess risk and plan camper activities and movement. As a team, we assign each trip a safety rating based on each locations pedestrian traffic, complexity of the physical location and how kids will engage the location (i.e. 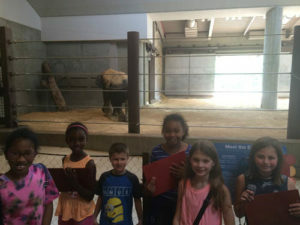 museum tour, museum scavenger hunt, watching a show, etc.). Based on these factors the team determines the risk for each location, which ranges from low, moderate, to high. This team is led by Mr. Mike who worked at an experiential learning school for 8 years, which focused on field trip experiences and frequently planned trips and assessed risk for these trips. Based on the risk designation, we try to minimize risk in three ways. First, we assign a teacher to student ratio that helps minimize the risk. With high risk trips we look to have a teacher to student ratio of 1:4 and with low risk trips we assign a maximum of 1:8. This is far lower than any other camp, and far below the COMAR requirement for field trips. 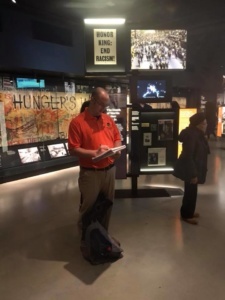 The second thing the team does to minimize risk is to plan exactly what the kids will do, from the route they will take at van drop thru security, to what they will be doing in each museum exhibit, to how they will obtain their popcorn and snack pack at the movies. Each movement is accounted for and predicted. Just like in the classroom, everything we do is initial and not accidental. We color code our campers to stand out for our teachers, but we also contrast our teachers to stand out for the campers and other adults (see right). In the event of an incident it is easy to see who is in charge, opposed to a mass of orange people. Every detail is designed for safety and to reduce risk. Lastly, having a great team that prepares for every trip helps as well. Our team is made up of education professionals who have training and experience leading children on different field trip excursions. The highest risk activity any kid participates in during the summer is swimming. At Active Minds kid’s safety is first, and our team has designed a way to minimize risk during swimming that sets a standard for safety in the summer camp industry. First, based on research of where lifeguards have the most “saves”, we have found that the highest risk activity when campers swim, is the swim test. Often kids take this when they first come to camp, so camp staff rarely have any reference regarding a campers swimming ability before taking the test. Swim tests require kids to swim the length of a pool. If a camper begins to struggle in the middle, there may be 45-50 feet of distance a lifeguard must swim in order to get to that struggling child. 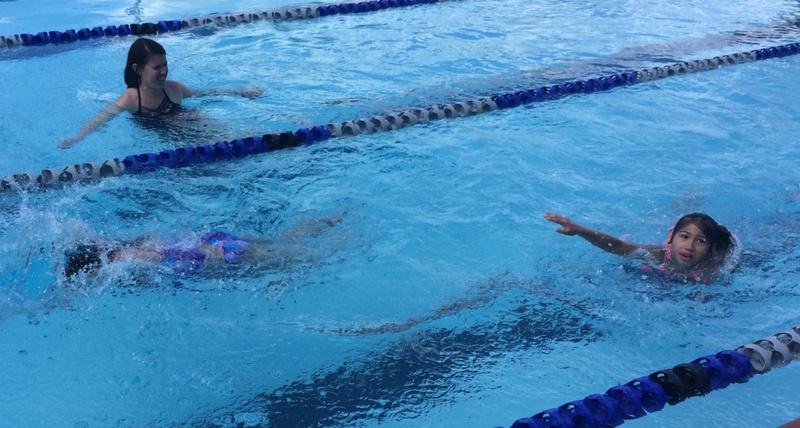 Therefore, to minimize this risk, Active Minds has “swimmers” who swim with them during the swim test (see right). In the event that a camper begins to struggle in the deep water our swimmers are close by to help, thus minimizing the risk. Second, COMAR regulations for summer camps state that you must have one “watcher”, from your camp, while kids swim. We have at least two “watchers.” This is significant because the lifeguards are watching everyone, while our watchers are only watching our campers. The third way we minimize risk is proximity. We not only have watchers, but swimmers in the pool with the kids, engaging them and watching them. This is especially important with the younger “Group A” campers who often are the youngest, littlest and most inexperienced swimmers. To work at Active Minds, you must have a written referral from someone in the county public school system recommending you for you to gain a spot in our employment process. It’s important to understand you cannot eliminate risk entirely, but you can structure a program in a certain way, and put in place safeguards, to minimize risk as much as possible. We can guarantee that at Active Minds we minimize risk more than any summer camp.